May 1st is Norway’s labor day. Of course, the day means different things to different people. To some, it’s a day to celebrate workers. To others, it’s the day you start planting your garden, and to others, it’s simply a day to relax. It also represents the start of something else, but that will wait until I have the best picture and story to explain it. Sunbathers Friday was an amazingly warm day – not hot, but warm enough to go out in shorts and a T-shirt. I spent a few hours just walking around – it may not have been as much of a workout as going to the gym, but it was nice just the same. As you can see, I wasn’t the only one who thought it was a nice day. 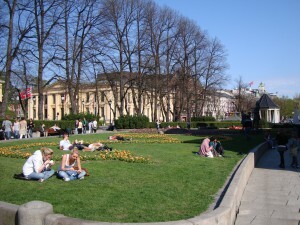 This picture was taken by the theater, but other parks, Frognerparken especially, were quite crowded. I’ve mentioned it before, but it can be rather difficult to meet people in Norway. While people at work are friendly, work and after work are very different, and coworkers rarely seem to go out together for drinks or anything else. In America especially, but also in many other places, if you go to a bar by yourself, you can probably still find people to talk to. In Norway? Not so much. Use opportunities at work. As I mentioned above, it’s fairly rare that coworkers go out together after work in Norway, but it does happen, and when it does, take advantage of it. Just know that Norwegians can really put away their alcohol! Also, depending on where you work, you might find people who get together to play sports. Where I work, for example, there’s a small group of people that play floor hockey every week. It’s a friendly game where the teams are chosen pretty much randomly every time, and it’s a nice way to get exercise while interacting with people outside of work. Online groups can be helpful. I just found out about the New to Oslo Yahoo group and attended a gathering on Friday night. The folks at this meeting were mostly American, but included people from Spain, France, and a couple of other countries as well, and they’ve all been through this or are going through it, so it’s nice to have people who can sympathize with you. There is also an American’s in Norway group on Facebook, which has some traffic even if it isn’t a hive of activity. Here’s some advice I’ve received: if you do start meeting Norwegians, don’t tell them you don’t know how long you’re staying or that you don’t know. Let them assume you plan on being here more or less permanently, otherwise they don’t seem to be as likely to take the time to get to know you or consider you a friend. Learn Norsk! This takes time, of course, but it’s worth it to try. For one thing, it’s a matter of respect. –Norwegian is their native language, and even though they may speak English very well, you should at least be willing to try and learn it if you’re going to live here. But I also think it’s related to the point above. –It shows you’re serious about living here. If all else fails, you can still try and talk to random people, just don’t be surprised if they look at you like you’re crazy.